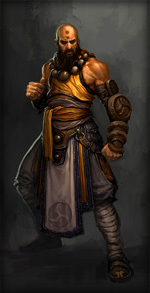 Welcome to the Diablo 3 Monk Leveling Guide section! The monk class is a powerfully disciplined group of martial arts masters who have trained their bodies and minds to be weapons of death. Within the leveling guides below, you will discover endless strategies, tips, tricks and walk-throughs to aid you in powerleveling your monk through Diablo 3 easily and fast. Here I cover the best skills and runes you should be using to get started off on the right foot leveling your Monk. Part 2 introduces a new batch of Monk skills that will not only increase the damage you do while leveling but also provide you with a good amount of useful abilities to stay alive! As you enter into the upper level ranges, choosing the right abilities becomes even more important for fast leveling. Part 3 covers, in detail, the exact runes and skills you should be using and why I believe them to be the best choices. In this article, you will learn some of the key Monk abilities and strategies to use as you get into the more challenging difficulty modes of Diablo III. Also, you will learn how to optimize your build for both solo and group play. You’re quite welcome, glad you enjoyed. More to come! This looks like very good guide thank you .